1.9 Steps for TSPSC AEE Recruitment 2017 Apply Online? TSPSC Assistant Executive Engineer Notification 2017 released on 17/11/2017. Candidates who are willing to apply for Latest TSPSC Jobs can check the eligibility criteria for 277 Asst Engineer (Civil) Jobs. Interested and eligible candidates can fill & submit the application form through online. The Starting Date to fill the application form is 24th November 2017. Last Date for the submission of the application form is 16th December 2017. Check the TSPSC AEE Notification details such as eligibility, selection process, TS RWSS Engineer Vacancy, etc. from this page. Here is a latest Employment News update from Telangana Public Service Commission. That is Telangana Rural Water Supply Department Notification 2017 was released for filling the vacancies of Assistant Executive Engineers. As per the official notification, there is a total of 277 vacancies available for the Civil department. So, to fill these vacancies, the officials will conduct a general recruitment. Aspirants looking for Engineer Jobs in Telangana must utilize this opportunity. Interested people can apply in online mode for this TS RWSS Dept Recruitment 2017 from 24/11/2017. The officials have announced that 16th December 2017 is the last date to submit the online application of TSPSC AEE Notification 2017. But before applying check the eligibility and other details once. Simply scroll down the below sections to know more details. Age relaxations are applicable for reserved categories. Aspirants must have done Bachelor’s degree in Civil Engineering from any recognised Institute or University. All the postulants have to pay the Application processing fee of Rs. 200/- and Examination fee of Rs. 120/-. One should deposit the fee in online mode only. How to Apply for Telangana AEE Recruitment 2017? Eligible contenders of TSPSC AEE Notification 2017 can start filling the online application from 24th November 2017. For this, you have to visit the official website or direct link given below. Fill the TSPSC AEE Online application with correct details and submit it before 16th December 2017. Click here for instructions to apply online. Are you looking for TSPSC Notifications 2017? Recently, Telangana State Public Service Commission has released 15 notification through the official website. Aspirants who are looking for government jobs in Telangana can utilize this wonderful chance and read the TSPSC Notification 2017 details through this page. Telangana Public Service Commission has announced the TSPSC AEE Recruitment notification 2017 today. Through the TSPSC AEE Notification 2017, Telangana State Public Service Commission is going to recruit the Assistant Executive Engineers in various Engineering Services. The officials have also invited the application forms through online. So, candidates have to go through online to apply for AEE Recruitment before the last date. Candidates who have completed bachelor’s degree are eligible to apply for TS 463 AEE Vacancies. The minimum age limit of the candidates must be 18 years. Get further details of Telangana Assistant Exe Engineer Notification 2017 such as fee, exam dates, admit card, etc through the below sections. Telangana State Public Service Commission has released 15 Notifications on Thursday to fill 2437 Vacancies. These total vacancies are distributed among various departments. Out of these vacancies, Lecturers in Residential Educational Institutions Society (REIS) constitute a maximum of 546 vacancies followed by 541 Veterinary Assistants in Animal Husbandry Department. This is a good opportunity for the unemployees who are waiting for the notification to the posts of degree college lecturers and junior college lectures in Government run colleges. The State Public Commission, Telangana has also issued the TSPSC Notification for the recruitment of 304 school principals in REIS, 463 Assistant Executive Engineer Posts. The TSPSC AEE Notification 2017 is released to fill the vacancies in civil, mechanical, electrical, and civil/mechanical in Irrigation & CAD Department, Road & Building Department, Ground Water Department, and Tribal Welfare Engineering Services. The TSPSC Notifications 2017 are announced to fill 273 deputy surveyor posts in Survey Settlement and Land Records Sub-Ordinate Services. TSPSC notification 2017 for 19 professors and librarians in Forst College and Research Institute at Mulugu is going to be released. Aspirants who are willing apply for Telangana 463 AEE Jobs can check the eligibility details here. Assistant Executive Engineer (Civil) in I & CAD Department Candidates have to possess a bachelor’s degree in Civil engineering or any equivalent qualification form a university/institution recognized by UGC/AICTE. Assistant Executive Engineers (Electrical) in I & CAD Department Aspirants should have completed Bachelor’s degree in Electrical Engineering or Electrical and Electronics Engineering or any equivalent from a university/institution recognized by UGC/AICTE. AEE (Mechanical) in Ground Water Department Contenders have to possess B.E Degree (Mechanical) or B.Tech (Agricultural Engineering) or equivalent qualification from a university/institution recognized by UGC/AICTE. Asst Executive Engineers (Electrical) in R & B Department Aspirants must hold a Bachelor’s degree in electrical engineering or any equivalent from a university/institution. Assistant Executive Engineers (Civil) in R & B Department Candidates have to possess a Bachelor’s degree in Civil Engineering from a recognized university/institution. AEE (Civil/Mechanical) in Tribal Welfare Engineering Department Applicant must be a graduate in Engineering (Civil/Mechanical) from a university/institution recognized by UGC/AICTE. Aspirants who have met the above eligibility conditions can check the selection process, fee, salary, etc for TS AEE Jobs/Vacancies. Applicants have to pay the registration fee of Rs. 200/- towards the online application processing fee and Rs. 120/- towards the Examination fee. SC, SC, BC & PH Candidates belonging to Telangana state are exempted from the payment of the examination fee. Steps for TSPSC AEE Recruitment 2017 Apply Online? On the homepage, search for “TSPSC AEE Notification 2017” link. Read the TSPSC notification details carefully. Click on TSPSC AEE 2017 Apply Online form tab. Navigate to TSPSC One-Time Registration link. If you are already registered then enter the unique reference Id and password. If you are a new applicant, then complete the registration process and then login with those details. Now fill all the details in TSPSC AEE Application Form 2017 with valid information. Check all the details once before submitting the TSPSC AEE Online application 2017. Finally, take the printout of the application form for future reference. Certificate of Residence / NativityDeclaration by the Unemployed. Medical Certificate for the Blind. Medical Certificate in respect of Orthopedically Handicapped Candidates. 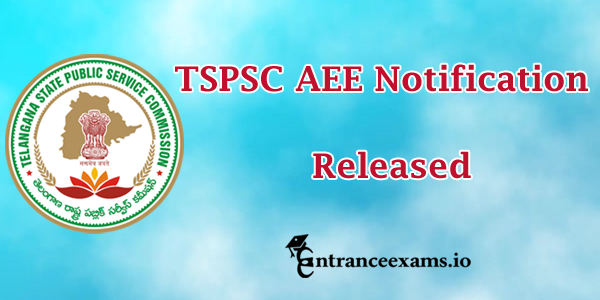 We have provided the TSPSC AEE Notification 2017 details on this page as per the official notification. Here we have also attached the TSPSC Official Notification 2017 link below. Also, we will update here the further details soon after the official announcement. So, we advise the candidates to refer to our site entranceexams.io for more updates on TSPSC Notifications 2017. Also, refer the official site for Upcoming TSPSC Jobs. SURYA first write english well then u cn apply for job. Whether diploma candidates are eligible or not. What is the date of editing mistakes in aee application. sir,will they postpone exam from 27th ,28th august? ?